Net Literacy Ends 2018 By Donating it’s 43,000th Computer to Homeless Families! What better way for Net Literacy student volunteers to ring out 2018 than by donating the 43,000th computer to a nonprofit that provides food and other assistance to homeless families in Indianapolis! Since 2003 and beginning at Carmel Middle School and then extending to school districts throughout Indiana, middle and high school student volunteers have worked during weekends and after school repurposing computers to donate to schools, public libraries, senior centers, community centers, independent living facilities, churches and other nonprofits throughout 91 counties in Indiana where over 2,000 computer labs were constructed. The picture below shows students from Carmel High School delivering repurposed computers that are ready to be donated. Posted in UncategorizedLeave a Comment on Net Literacy Ends 2018 By Donating it’s 43,000th Computer to Homeless Families! Beginning at Carmel Middle School in 2003 and still going strong at Carmel High School over 15 years later, friendly student volunteers continue to “adopt” senior citizens to answer their questions and in 2019, help them better be able to use their laptops, tablets and smartphones. 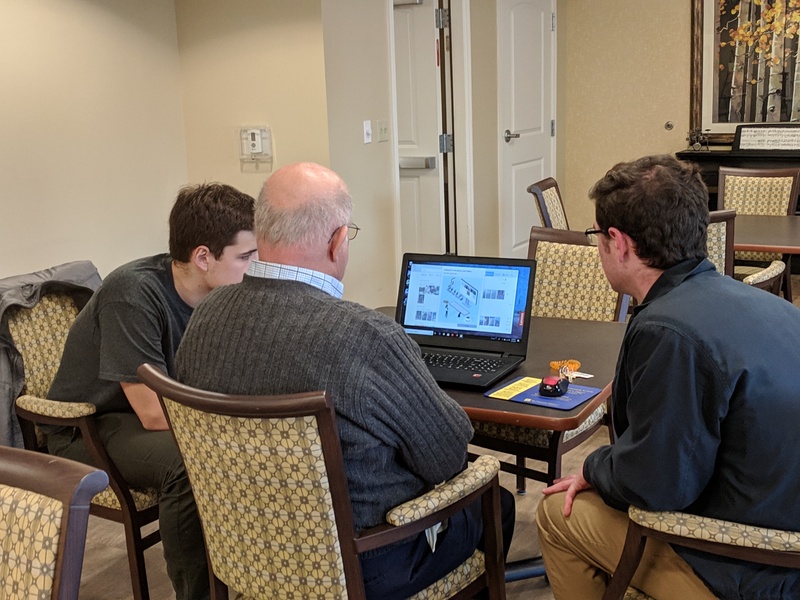 When the Senior Connects program first started, Net Literacy’s student volunteers held computer drives and built hundreds of computer labs inside independent living facilities, senior apartments, and senior centers because few seniors owned their own computer. Fifteen years later, most seniors own at least one device and so now, students spend their time answering questions and teaching them how to use their devices. 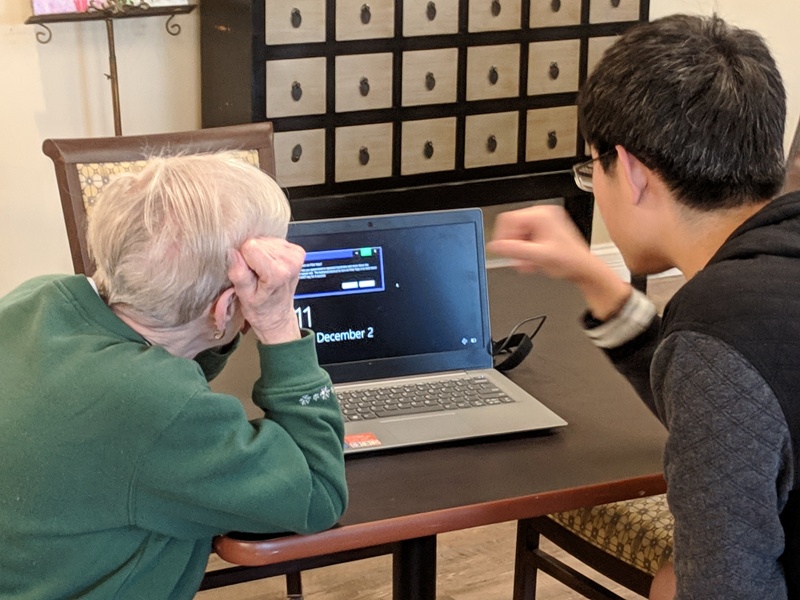 While technology can feel unfriendly at times, the Senior Connects model pairs a friendly student volunteer with a senior for one-on-one instruction so things can be explained in a way that helps reduce any fears the seniors may have of the technology. For more information, contact Dan at danielkent(at)netliteracy.org. Whether you’re a parent, a teacher, a teen, or just curious about digital literacy and citizenship, Google and its partners have a list of resources to help you get to know the web. Whether you’re a parent, a teacher, a teen, or just curious about digital literacy and citizenship, you’ve come to the right place. Google and our partners have compiled a short list of helpful resources for getting to know the web. Read on, and continue to explore the wonders of the web with us. Bust those technical termsThe web can be confusing, and even the savviest Internet user has come across terms that don’t make sense. Like “WPA2.” Or “IP address.” Or “spyware.” We’ve made a list of some common technical words and explained them here as simply and accurately as we can. Becoming tech-savvyExplore Internet 101 and learn more about the web and beyond. Good to Know YouTube channelWant to see more videos about privacy and security? Take a look through our YouTube channel. Inside SearchDiscover all the features and tricks to master Google search. Get information on Google’s newest search features and learn tips for beginners, pros, and everyone in between. YouTube Safety CenterLearn how to flag videos that violate our Community Guidelines, keep personal videos private, and block users whose comments or messages bother you. 20 Things I LearnedDo you have questions about web but were too afraid to ask? We have the book for you. Learn about the web and browsers in this interactive experience created by Google. Computer Security provides simple steps to help you protect yourself and your computer from scammers, hackers, and identity thieves. Online Shopping Tips can help you get the best deal and avoid unnecessary hassles. Protect Your Computer from Malware provides tips on how to avoid, detect, and remove viruses and spyware that were installed on your computer without your consent. Digital Literacy Portal for the entire familyAs more of our life happens online, Internet skills are becoming crucial to living responsibly. What skills do you need to navigate Internet society? How can parents and educators teach themselves, their families, and their communities about important topics like identity protection, fraud detection, and digital citizenship?ThinkB4U is a collaboration between Google and safety experts Common Sense Media, ConnectSafely, and the National Consumers League. Together, we are tackling some of the biggest learning curves thrown at the average user in a fun and interactive way.There’s still a long way to go to achieve digital literacy for everyone, but we hope that projects like ThinkB4U will boost advocacy for online safety education, the importance of which is invaluable in our deeply connected world. Download our Safety Center bookletOur top tips for staying safe and secure online in a format that you can print and keep. Now You KnowCheck out videos created for youth, by youth on topics like cyber-wellness, security, and privacy. A Good Digital ParentingA Good Digital Parenting is a project of the Family Online Safety Institute (FOSI) designed to help parents, teachers, and teens connect, share, and do good online. Teach Parents TechTeach Parents Tech lets you select from more than 50 basic how-to videos to send to Mom, Dad, your old college roommate, your neighbor, and anyone else who could use a little help with tech tasks—whether it’s how to copy and paste or how to share a big file. Get Your Folks OnlineGet Your Folks Online, a partnership between Age Action and Google, provides several interactive courses on the basics of the Internet. Online Safety RoadshowLike Drivers Ed for the web, the Online Safety Roadshow is a 45-minute digital citizenship assembly for teens that shares tips and tricks for being safe and smart online. 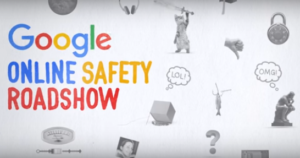 Google Digital Literacy and Citizenship CurriculumTeach your students to be safe and smart online. We’ve teamed up with online safety experts iKeepSafe to develop a curriculum that educators can use in the classroom to teach what it means to be a responsible online citizen.The curriculum is designed to be interactive and discussion-filled, and to allow students to learn through hands-on and scenario-based activities. On this site, you’ll find a resource booklet for both educators and students that can be downloaded in PDF form, presentations to accompany the lesson, and animated videos to help frame the conversation. Online Safety Roadshow ActivityThese handouts complement our Online Safety Roadshow to continue the conversation in the classroom. Posted in UncategorizedLeave a Comment on Whether you’re a parent, a teacher, a teen, or just curious about digital literacy and citizenship, Google and its partners have a list of resources to help you get to know the web. From our friends at A Platform for Good – it’s the perfect holiday gift! Click on the link to surprise your “friendly adults” with the gift of knowledge for the holidays! And endorsed by your friends at Net Literacy. Happy “Digital Literacy” Holidays! Net Literacy’s computer, Internet, email, safety, and social networking training manuals are available to all schools, nonprofits, and parents that use them for teaching. For profit organizations that use our content for noble reasons can also use or repurpose them. As an example, Google Russia used our computer, Internet, email, and social networking training manuals as the basis of their training manual which can be viewed by clicking here. Google’s credit to Net Literacy is on the second slide. We’re proud that Houston Public Libraries has done similarly. Their training programs are viewable by clicking on the two documents below. Houston Public Library’s credit to Net Literacy is on the first slide via their including our website’s name. Please email me at [email protected] if you have questions or if you are interested in repurposing or white labeling Net Literacy’s content. There is no cost for this service – we do not charge any nonprofit that promotes digital literacy and digital inclusion. Net Literacy is proud that we’ve never charged anyone for any of our products or services. A Platform for Good Shows How Millennials Use Technology for Good! Did you know that 84% of Millennials who made a donation to an organization last year gave or wanted to give online? What about that 80% of social media-using teens say they have defended victims of online harassment? This cool new infographic shows how teens and twenty-something’s are using their devices for good. Posted in Uncategorized1 Comment on A Platform for Good Shows How Millennials Use Technology for Good! In 2003, a team of middle school students founded Net Literacy and today, middle school students are still making a difference! To read more, click on the image below or to read the article directly at At Fishers by clicking on this LINK. Net Literacy Encourages Everyone to Enter the “What I Wish My Parents Knew” 60 Second Sweepstakes! If you’re a student (ages 13-21) and have about 60 seconds, you can submit 140 characters about what YOU wish your parents knew about technology. The prize – an Xbox Kinect! Net Literacy is a proud supporter of the Family Online Safety Institute and a Platform for Good. Make a difference and add to the thoughtful discourse on the Web – just click on the image below! What I Wish My Parents Knew Sweepstakes! Posted in UncategorizedTagged Family Online Safety Institute1 Comment on Net Literacy Encourages Everyone to Enter the “What I Wish My Parents Knew” 60 Second Sweepstakes! On September 23rd, Net Literacy will discuss it’s model and some of the outcomes realized by this student-managed NGO at the United Nation’s Broadband Commission for Digital Development Summit in New York.